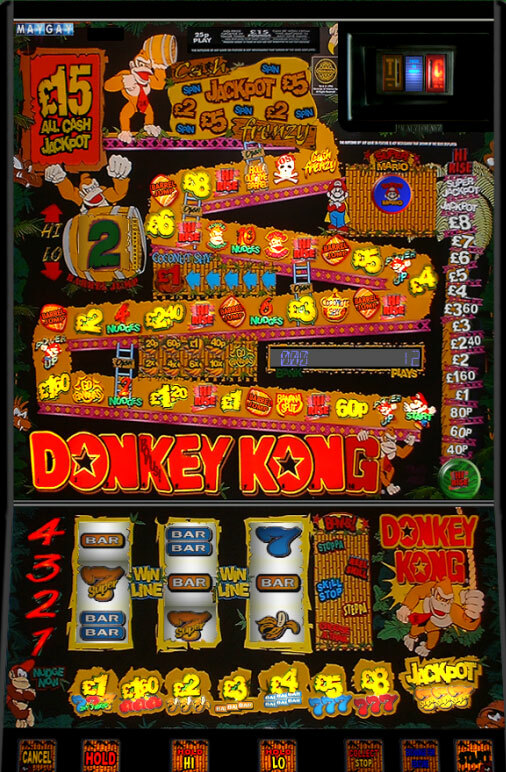 The ultimate guide to playing Fruit Machines for fun! 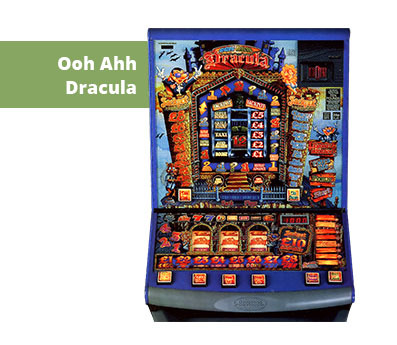 When you mention fruit machines to anyone who has played online slots they think you are talking about the same thing, of course you are not! 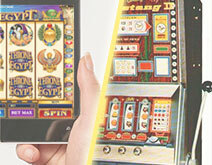 Online slots require no skill at all, you load up cash, choose the amount of win lines you want to play and that's about it! There is no way to ruin or influence the online game. 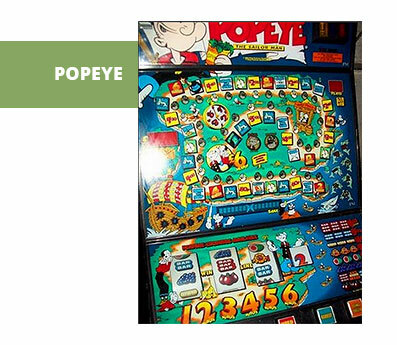 Now as anyone who has ever played these machines will tell you, it is possible to mess up your nudges, it's possible to lose it all by going higher than a 2 (and get a 1) or get the dreaded “?” on the feature board and hit game over! 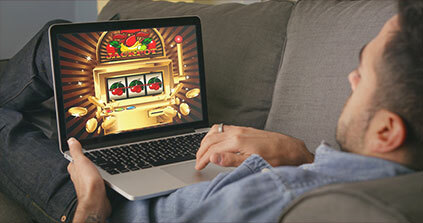 With fruitys there is a degree of skill that just doesn't exist on most online slot games. Whilst these machines can be incredibly annoying, this element of skill brings so much more engagement and playability to the games. On this page I pay homage to the machines that have taken so much time (and money) from me over the years. 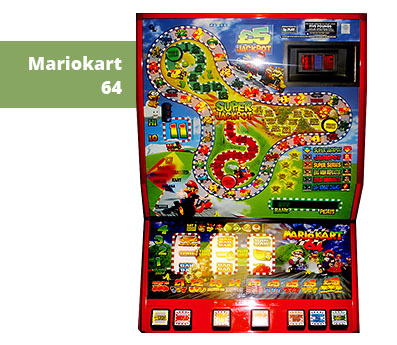 I will cover the basics, share some of my favourite machines from days gone by and look at the makers of these games. I hope this brings back some memories for you. The Basics, much more engaging than slots! It's fair to say that us Brits love to gamble! Whether it is a couple of quid on the Lotto, a fiver on the Grand National or dispensing our spare change into a fruit machine at our local. In fact I do not remember the last time I went into a pub and didn't see at least one fruity with it's flashing lights enticing me to play! Most of us will have at some point played these “bandits”, however if you are a new comer to playing these machines then this next section is for you as we explore the basics around the machines. These games are there to make money, of course they can bring entertainment and fun to anyone who plays them but the bottom line is, they are there to make money! 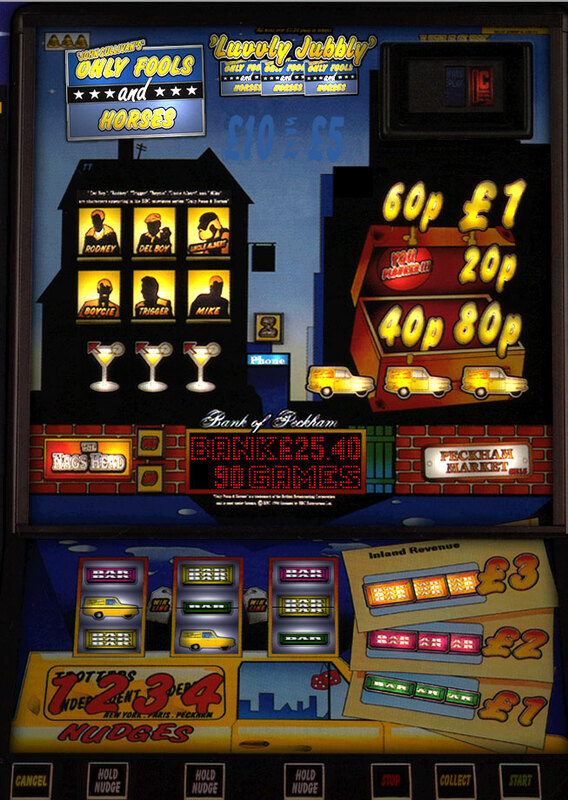 An average pub machine will have a pay-out rate of about 80%, this however does not mean that for every £1 you put in you can expect 80p back! Instead the machines are programmed to “spree” when they have amassed enough money to pay for the pay-out. 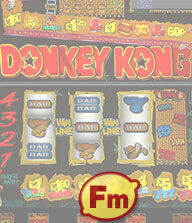 This is what every fruit machine player is hoping for. 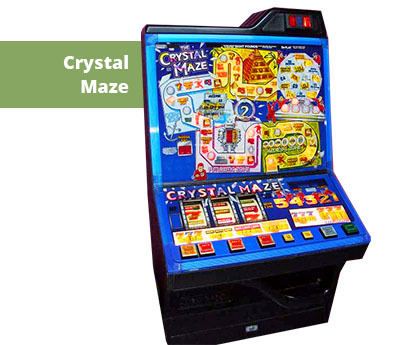 So let's have a look at some of the common features of these machines. Features You will Find on a Fruity. 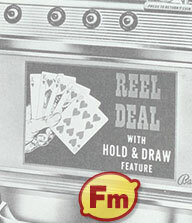 A quick press of this button will “hold” the reel or reels corresponding to the button you press. Useful if you have a couple of symbols on the pay line and you want to try for three matching. Holds are used most when trying for a matrix feature. 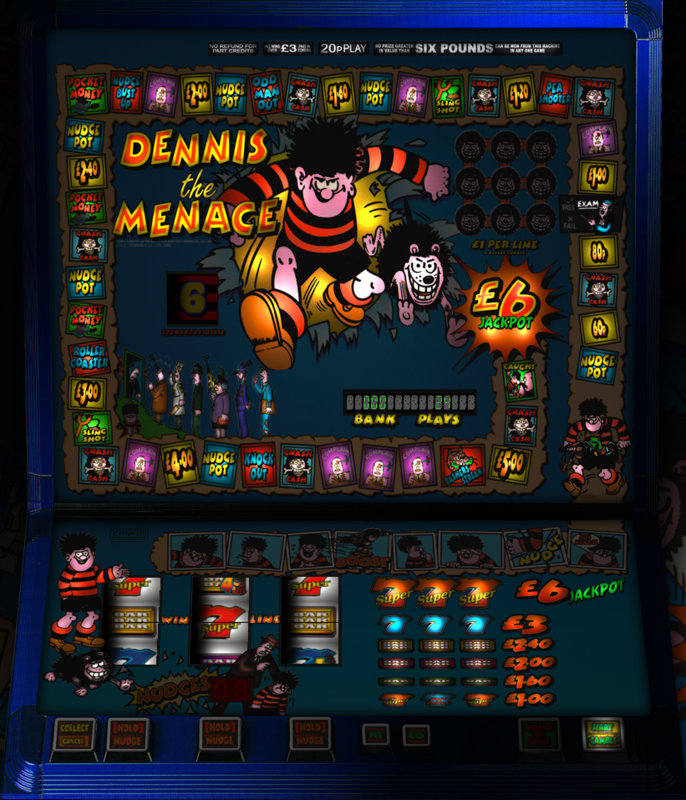 After a spin has been completed you may be awarded nudges, on most machines you can only nudge the reels down but some older machines such as Each Way Nudger allow you to nudge up. The number of nudges given is usually between 1 and 5. Always look closely to see if it is a hold or nudges that are awarded. A players favourite! 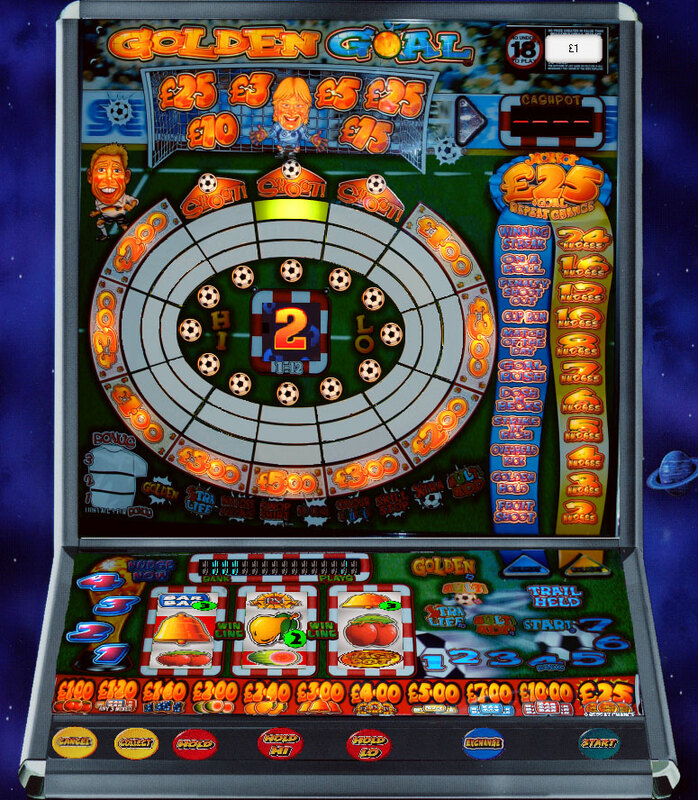 A feature is the sub game that you get to play and varies depending on which machine you play on. Most of the popular features involve moving around a board and landing on squares. These squares may award you extra cash, nudges, increase the cash pot, however some squares are bad news and may result in the bonus round ending. On one side of the screen there is a cash ladder with amounts of money that increases with each step. Often you will get a chance to boost this either by going higher or lower on a number or by landing on a cash booster square on the feature. So you've been offered a feature but you like the look of a different one, not a problem, try a gamble! 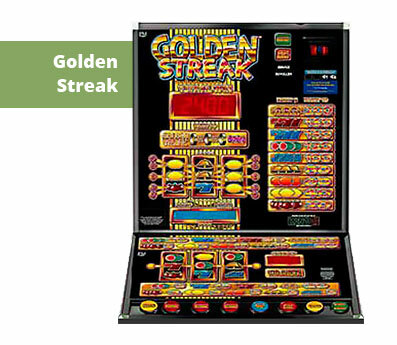 The feature gamble works differently on different machines but usually means trying to guess higher or lower on a number or on some machines you press the start button to gamble. On many of the machines you need to get to a certain number to activate the feature, lots of machines give you a bonus if you get to a certain number (usually 4). Once you hit this bonus you will see such goodies as “select a trail”, “number boost” or nudges. 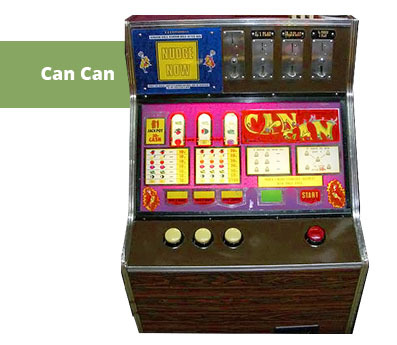 Some machines feature a cash pot which fills up over time. Many professional players love the cash pot indicators as they can see at a glance if a machine has paid out the cash pot recently. 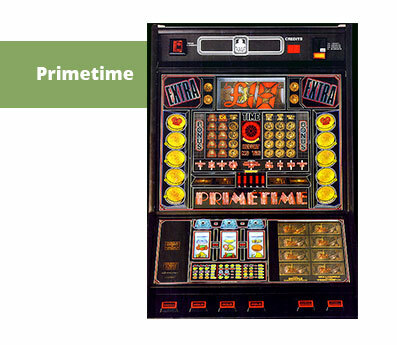 There is even more excitement and competition when it is a club machine which can have a cash pot limit of £250, even back in the early 90's. After some features you may get a repeat chance or even after a jackpot, just hit start to see if lady luck is smiling on you. 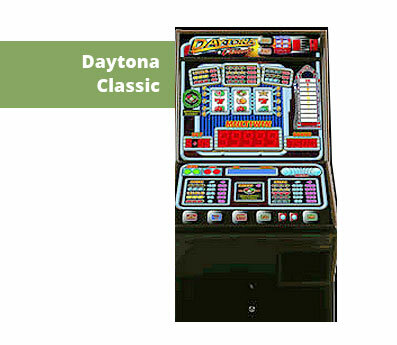 If a machine is ready to payout then it is not unusual to see a win repeat several times. It can be a an indication that the machine is spreeing. 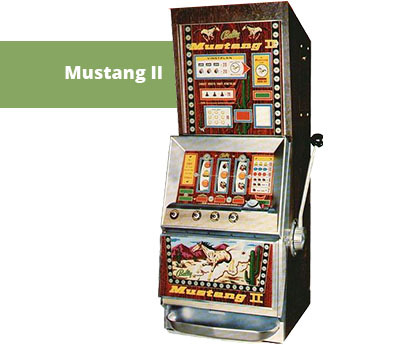 It's not just jackpots and features that may repeat either, sometimes cash wins as well. 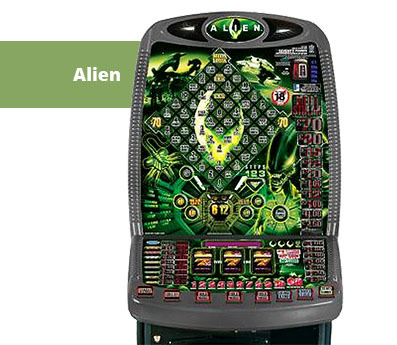 Keep an eye on the little LED (Light Emitting Diode) screen as it may give you hints on how to win. This might be a very subtle message such as “wink wink” when you have had two holds in a row (see our hidden features table) or a more direct message such as “don't hold any” or “hold them all”. Although each game will have subtle differences the key aspects to most games are the same. 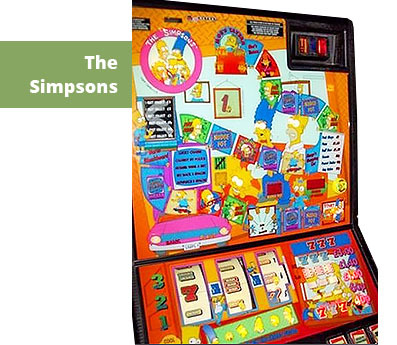 For this example we are going to have a look at JPM's “The Flintstones in Viva Rock Vegas” and show you how some of the key terms we have discussed are represented on this fruit machine. The start button, once you have put in your credit you press this to start the reels rolling. In some games you also use the start button to stop on a bonus feature and also to play the sub games. 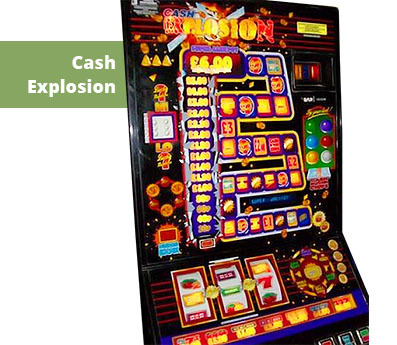 Use the exchange button to turn a cash win into the feature board, on most machines one gamble on a win is enough for the machine to offer you an exchange. 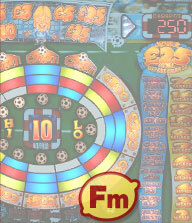 If you lose on the feature board you lose any cash from the winning spin. 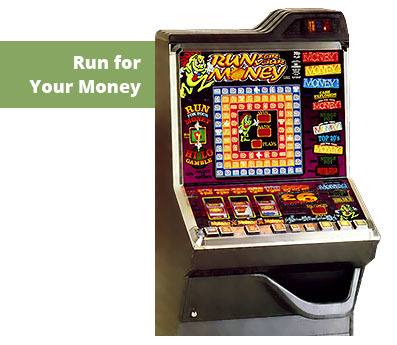 Collect, this is used to collect an amount offered or a feature offered but also to ask the machine to return your winnings once all your credit is used. Hold buttons, from time to time you will be offered holds, this is useful if you have numbers on the win line and you are trying to advance the feature trail. Nudges are also controlled by buttons. Cancel button, this is used to remove any holds you have selected. On some machines this button also acts as a slow down button which makes picking the feature or nudges a lot easier. From time to time you will see the nudges light up which will allow you to “nudge” the reels down into a different position. This can help you gain a win or get three feature icons in view. The feature trail, the aim is to get enough numbers to get the feature start (in this example 8) or higher. Sometimes the feature trail will hold which will preserve the numbers you already have. Feature trail bonus, landing on this bonus square will give you the chance to boost your number total. 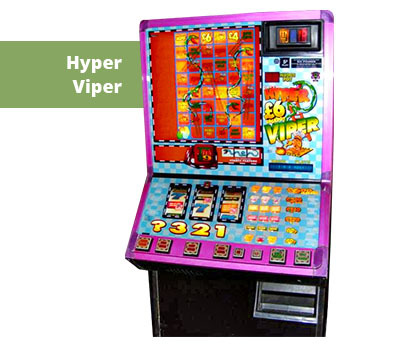 Other bonuses can include, respin, numbers in view, win spin and skill chance but this varies between different machines. 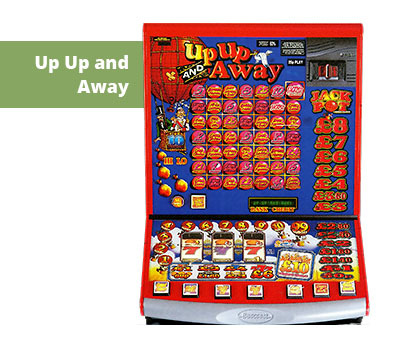 On some machines you can enhance your chances of winning by getting higher than the start position on the feature trail. 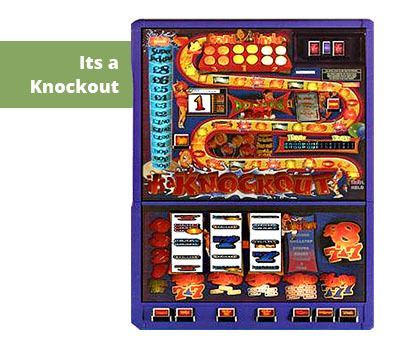 Multi-add gives you extra starting items such as cash or nudges, extra life gives you a second chance should you lose on the feature board, multi bonus adds a extra bonus to the feature board and super knock-outs adds knock outs to the pot should you get three gold coins. With each spin you make you will see this number change, contained here is a number from 1 – 12. When you have a win you can gamble the win by guessing if the next number will be higher or lower than the number you can see. This is also used when you are on the feature board and when you press start you will move around the feature board by how many spaces shown here. 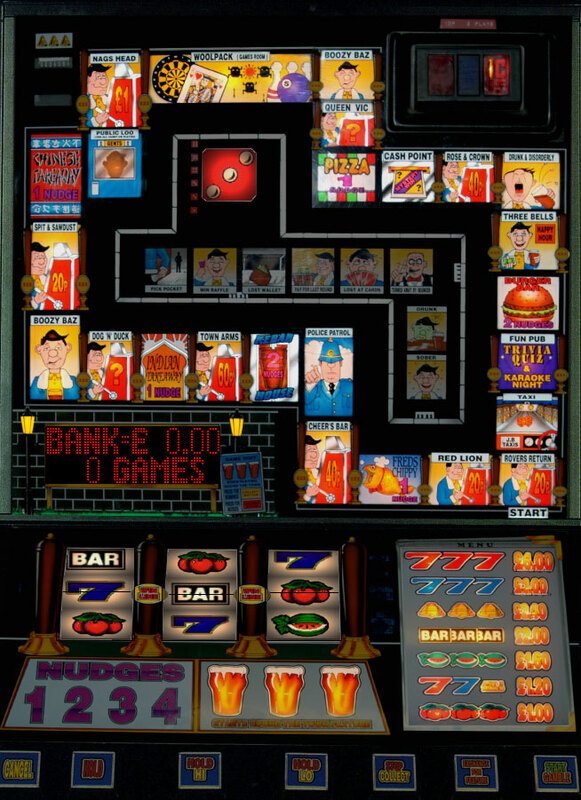 The feature board, this is where all the action takes place once you are on the fruit machines feature. Each square on the feature board has an action attached to it, for example +3 nudges will add 3 nudges to the nudge bank, +3 cash will add 3 steps to the cash offered. There are also bonus squares that will help you, however some squares such as the “?” square can mean the feature ends. The features, each one of these titles is a mini game you can play to earn cash. Usually the higher up the trail the feature, the more money you are likely to win. 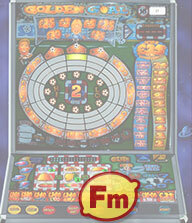 Part of the skill of playing, is knowing which features are which and how to play the sub games. 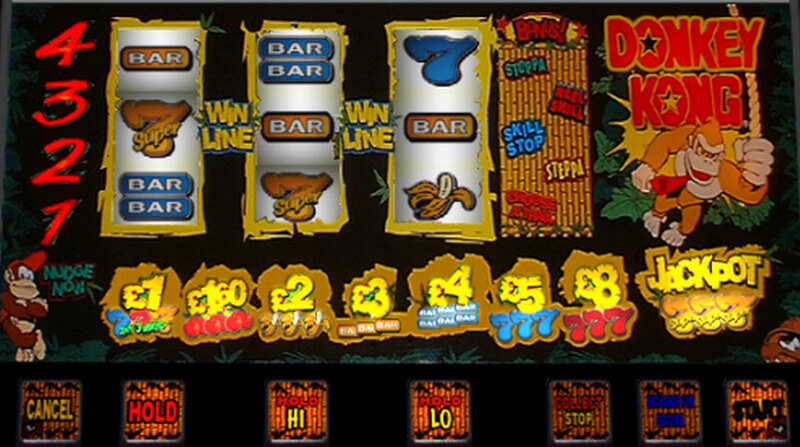 Cash trail, every time you land on a +cash square it will increase the amount of cash that is on offer. At the beginning the increment is quite small but gets larger with each step. Nudge pot. Each time you land on a +nudge square the amount of nudges available to you will increase. 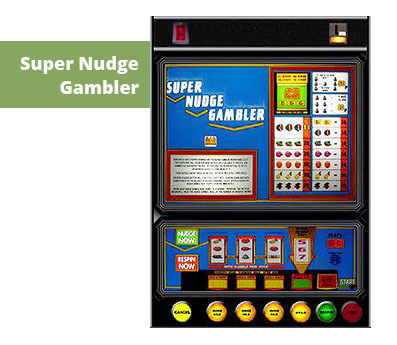 Unlike nudges in the normal game you don't get to nudge until you collect the nudge pot. 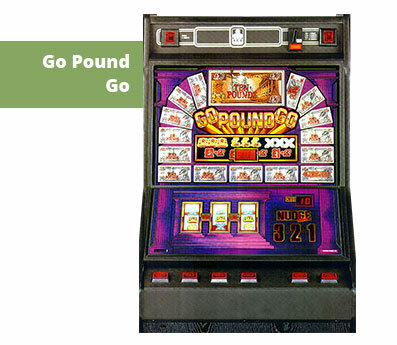 On many machines the small LED display will tell you the amount you can win by using the nudges. On this machine if you light up all the letters to “Viva Rock Vegas” then you get to play a super game where many amounts are shown. Hit the start button and you will win an amount with the chance of the feature repeating so you can win more. How to Increase your Chances of Winning! 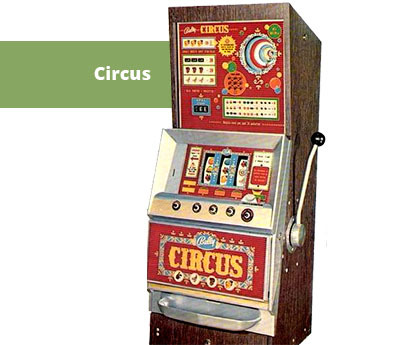 Unlike online slots where the outcome of every spin is random, older fruit machines were designed to go through cycles of payouts and then collect money to pay for the next payout cycle. If a player was knowledgable enough about a machine or could read subtle signals then it was possible to maximise the chances of winning. Here are a couple of tactics used by experienced players. Hold After Nudge Cheat One of the most popular and a well known cheat. After you have had nudges and have 2 symbols the same on the win line, if you are then offered a hold, ignore the holds and press start. 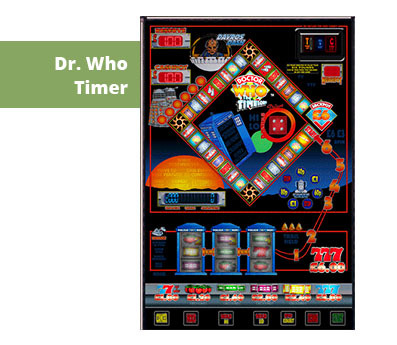 The machine will spin in a win based on the 2 symbols you nudged together. Hold After Win Cheat After you have spun in a win, on some machines you may notice a very subtle flash of the hold buttons. If this happens press all three hold buttons and press start, the win will then repeat. Hold 3 Times Cheat If you receive the option to hold and you hold two symbols and the third symbol doesn't come in. If your machine offers holds again on two more occasions, on the third hold it will automatically spin in the win. 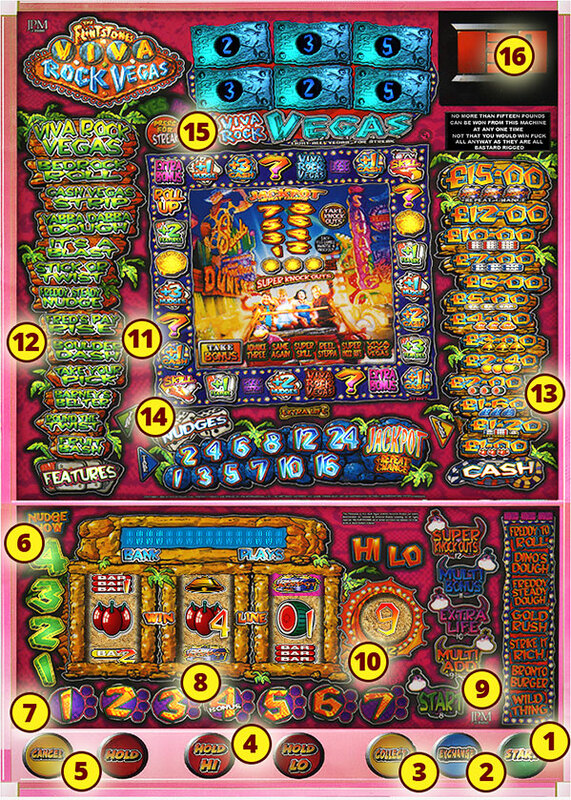 Win Below / Win Above Cheat This is quite a unique feature and is only on certain manufacturers machines but if you have a winning combination above or below the win line (for example you have 3 melons above the pay out line) the hold buttons may flash briefly or the reels wobble. If this happens hold all the hold buttons and press start and the reels will drop the win in. This is quite a rare feature. Spare/Cancel Button Cheat On some fruit machines there is a logo of the machines manufacturer on a button, this will often flash to indicate you can press it. Pressing it will slow down some features or bonuses, this makes picking the bonus you want so much easier. This is also sometimes the cancel button. Machine Goes Red Cheat This is the cheat that gets most players very excited, it changes from machine to machine but either the lettering of the machine goes red or the machine constantly flashes. This means "invincible mode" has been activated and a jackpot is guaranteed. Just keep hitting the start button and the feature will continue until you have the jackpot. Backing is when you can hear your inserted coins drop straight into the overflow cash collector, rather than into the coin tubes. 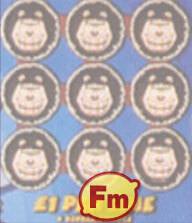 This can be an indication that the coin tubes are full so the machine is likely to spree very soon. But... and this is a very big but! It could also mean the machine has recently been emptied and has been refilled by an engineer! 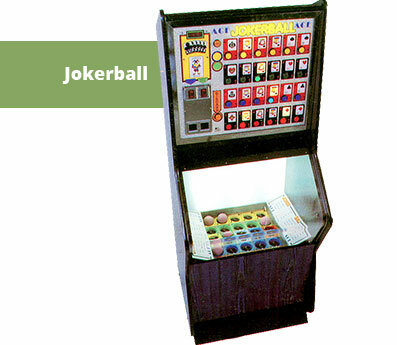 Also some establishments such as arcades and some service stations will regularly fill the machines to stop the player being able to tell. In the early days and certainly in the early 1990's it used to be possible to look through the reels and see the coin tubes, this used to enable you to see how full the tubes were. However since the introduction of hoppers, this is no longer possible. So some players have started to use refill keys. Refill keys are provided when you rent or buy a machine and enable the landlord or technician the ability to refill the machine without having to open up the cabinet. 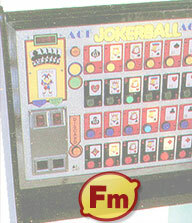 When you insert a refill key it will give you information on the machines status with information such as last win, error messages, last bank total and the important one for a player – the hopper balance. Whilst having these keys is not illegal and you are not affecting the machine in anyway, if you are seen using one then the chances are you will have a very quick exit from the pub or arcade you are in. 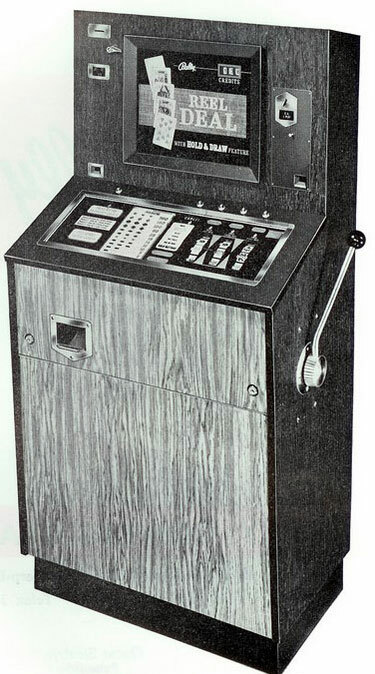 All games since the 1980's are not mechanical, they are in essence computer programs and at the heart of every machine is a computer chip which controls when a win is awarded, when holds and nudges are offered, in fact every aspect of the gameplay. Now sometimes a bug goes unnoticed during testing and the machine is released to players, players may discover this fault and by taking advantage of this coding error they are able to regularly empty the machines. Manufacturers will discover the flaws and release a software update to fix the fault. 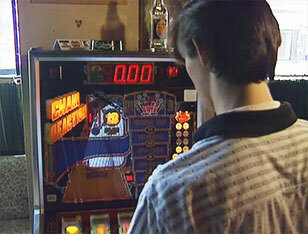 However in that time a player could have won many hundreds if not thousands of pounds from the machine. This is one of my pet hates and I seriously advise against this! This is where you wait by a machine and let someone else put lots of money in. When the person has spent all their money or goes to get more change (which has happened to me a few times) you then play the machine in the hope they have filled it enough so it pays out. Again I cannot stress what a dirty trick this is and should be avoided. It is very unlikely you will carve out a career in playing bandits! 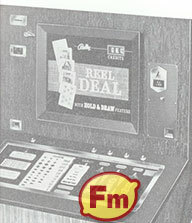 Playing machines professionally often means carrying a large float of change with you as pubs will often refuse to change notes due to lack of change (this is not so much as an issue nowadays due to machines accepting notes), you will also need to know a machine very well and even then unless you are guaranteed to win. Another factor is that machines change very often and it can be expensive to learn new machines. 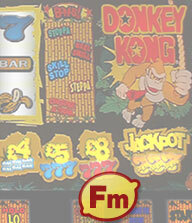 Most of us play fruit machines due to the playability and fun we get from them. The best way to approach these games is for enjoyment and like any other form of gambling, only spend what you can afford to lose. It is very easy to try and chase your loses, don't do it! There is always another day. A Unlimited Unlimited Regional Casino (previously called super casinos) none exist at time of writing. 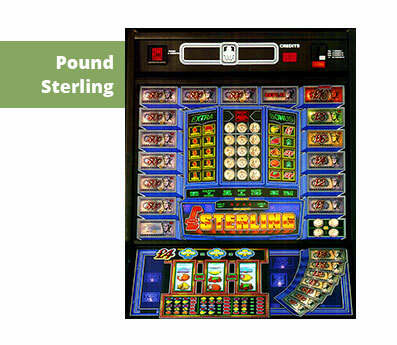 B1 £2 £4,000 Large and small casinos. B2 £100 (in multiples of £10) £500 Betting shops, casinos. 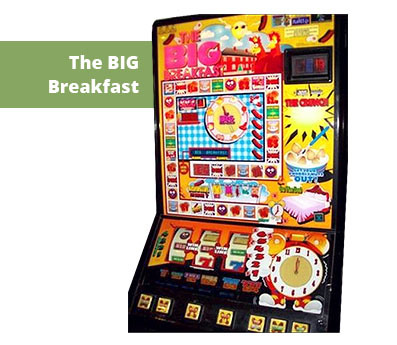 B3 £1 £500 Bingo Halls, Adult Gaming Centres. B3A £1 £500 Social clubs, members clubs, miners welfare institutes. B4 £1 £250 Commercial clubs, alcohol licensed premises with machine permit. C £1 £100 Alcohol Licensed Premises (Automatic Entitlement). Pubs. 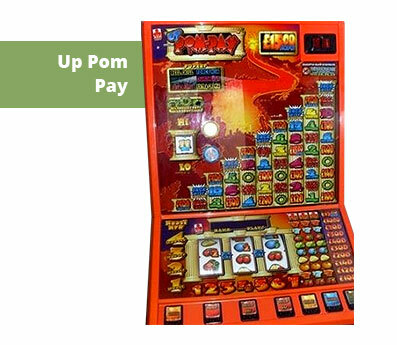 The jackpot available to fruit machine players has been rising slowly over the years and has recently been increased to £100 in pubs. This is great news for players who don't have access to a private members club where the jackpot can be a huge £500. 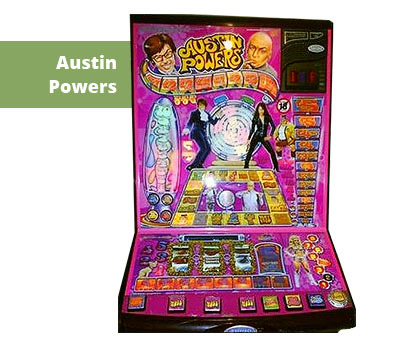 Once upon a time fruit machines belonged to the same line of machines as slots, however in the middle of the 1960's parliament deemed that in order for a machine to be able to pay out a prize then there must be an element of skill involved in the games. 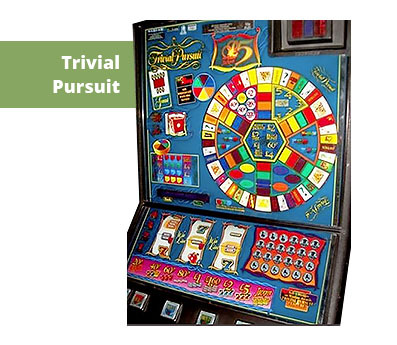 These games were called AWP which stands for Amusement with Prizes and this is when the split with traditional slots took place. It is worth noting that there are two types of skill, pseudo (which means fake) and true skill. Pseudo skill is evident on bandits and very often you will be given “random” nudges in a situation where you only need 2 nudges for a huge win. You hit start and surprise surprise you only get one nudge. Or you are gambling higher or lower to get a better feature, the number is on 2, you go higher and what number do you get? Of course, you get a 1 and it's game over! True skill on the other hand has an element of skill, the machine will very often display the words “true skill” on the LED display and the timing of you hitting the correct result is totally down to you, it is these occasions that enabled machine manufacturers to stay on the right side of the law. However it is true to say that ethically bandits are a grey area as they make you believe you have a chance to gamble to win but in most cases the result is already known. 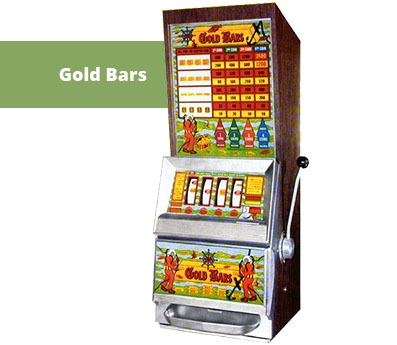 For the UK market there are broadly two types of fruitys available, the standard three reel AWP (amusement with prizes) type that you will find in pubs, takeaways, amusement arcades and service stations to name just a few and club machines which tend to have 4 reels and offer a lot higher jackpots. Wouldn't it be boring if all fruitys were the same? 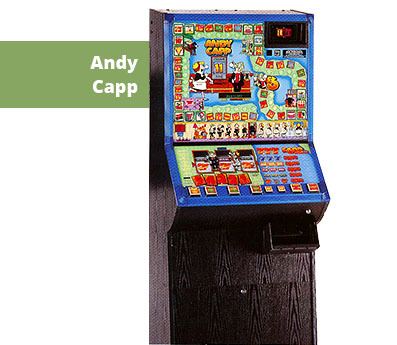 Admittedly it would be a lot quicker to learn the tips and tricks of these machines but for me, this is what makes fruit machines so exciting, the fact that they are always evolving. 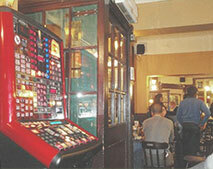 I used to love walking into my local on a Friday night and seeing they had changed the “bandit”. If I lost money I would wish the old machine was back but if I won I would wonder why they didn't make the change sooner. 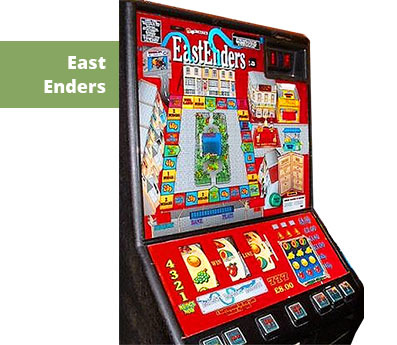 In this next section we are going to explore some of the classic fruit machine makers and where possible choose a classic game from that developer. There are of course many more manufacturers than we have listed here but we have concentrated on the powerhouses of the gaming world, some of these companies it is sad to say no longer release games. 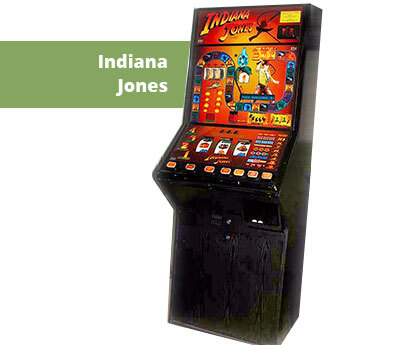 JPM have a long history spanning 40 years and are famous for creating some of the most loved pub machines that have been made, titles such as “Give us a Break”, “Hagar”, “Indiana Jones” and “Sonic the Hedgehog” made JPM a firm players' favourite. It is great to see JPM are still alive and kicking and the new range of machines they have produced look great. JPM was a difficult choice to make as there have been so many games we have loved from this gaming powerhouse. 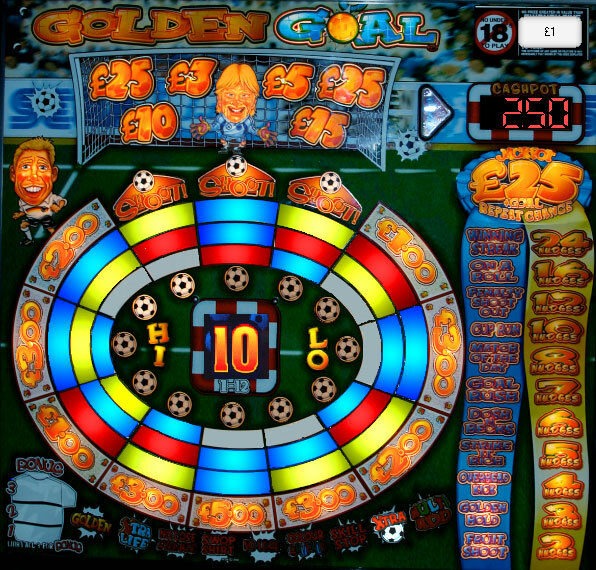 However, we decided to go for a strange choice and have picked Golden Goal and surprisingly not because it's the best game JPM have done! It is because it is so different to their usual games. Instead of going around a board the feature comprises of going higher or lower on a number, get three guesses right and you get an extra bonus. Fun to play even if the feature is very tight. Ace Coin Equipment. 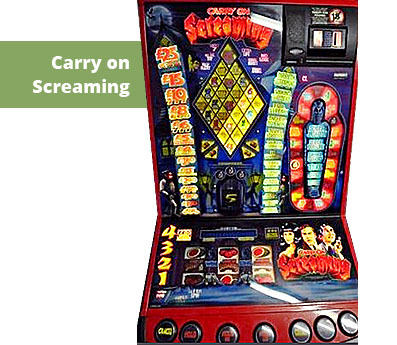 This fruit machine manufacturer from South Wales have been producing high quality games since the days of England winning the world cup and had a boom time in the late 80's and early 90's. They are still going strong and despite not having a presence in many pubs they are producing some solid, playable games. 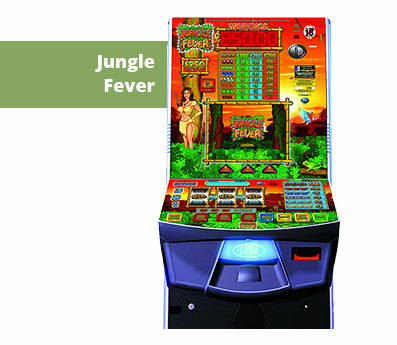 We really like the idea of their new multi-slot cabinets which have many games all in one complete package. Whilst this isn't really a fruity in any shape or form, we had to choose this classic as it reminds us so much of day trips to the beach! 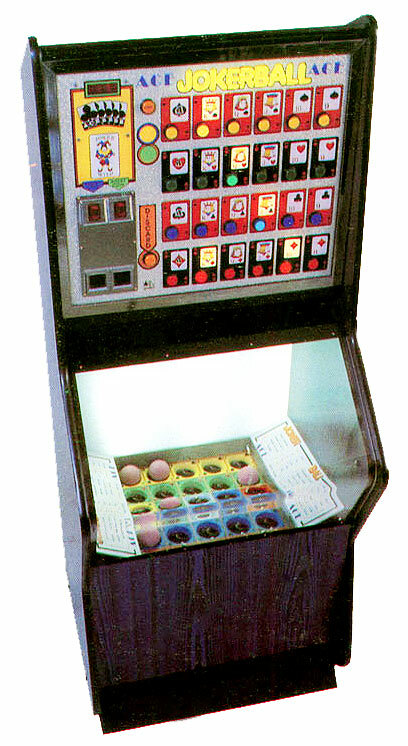 It was such a simple game to play, put a coin in and air would blow the balls about, after a while the air would stop and the balls would land in holes represented as playing cards. No skill involved at all but used to provide great fun in our younger days. 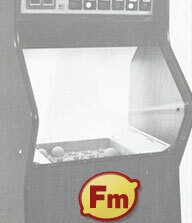 Bally are really on our list due to the fact that they were so instrumental to the arcade revolutions of the early 60's. 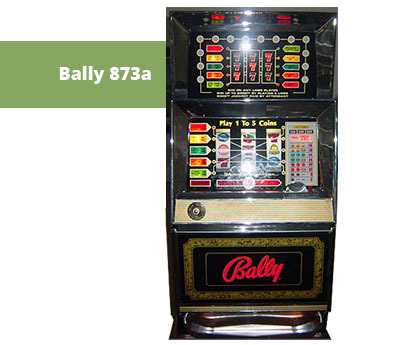 Bally made everything from pinball machines, jukeboxes and of course slot machines. Not many of their newer machines ever made it across to these shores but it's possible you will still find some classic 50's, 60's and 70's machines in seaside towns. So this pick of manufacturer is mainly for nostalgic reasons. 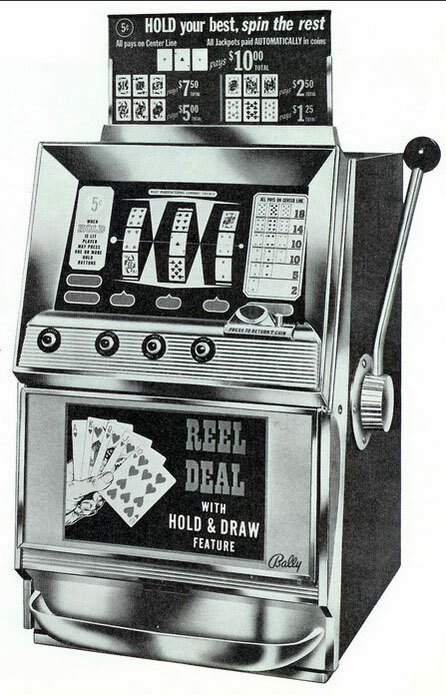 I have chosen Bally's 1967 classic Reel Deal for my pick from the American giant, not particularly for this model but because of the breed of hold and spin “one armed bandits”. 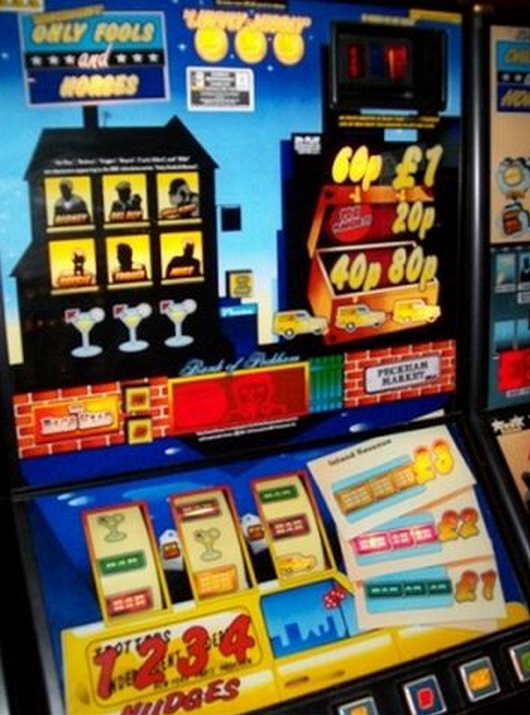 I have memories of finding a vintage arcade in Blackpool and within a small room there must have been 20 or 30 very similar American slots and I found them great fun to play. In the modern world of silicon chips and loud machines there is something quite unique in these old classics. 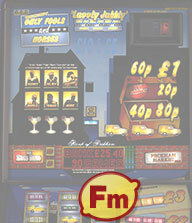 Barcrest along with JPM are our favourite fruit machine makers, they have produced some of the best titles of all time. Classics such as “Big Break”, “Boulder Dash”, “Duty Free” and “Monty Python's Flying Circus” are as playable today as they were when they were first released. Barcrest was one of the first producers of TV and movie licensing and based many of their games on well loved characters. 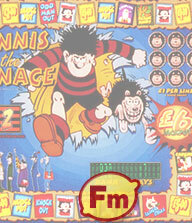 Featuring everyone's favourite rogue, Dennis the Menace! 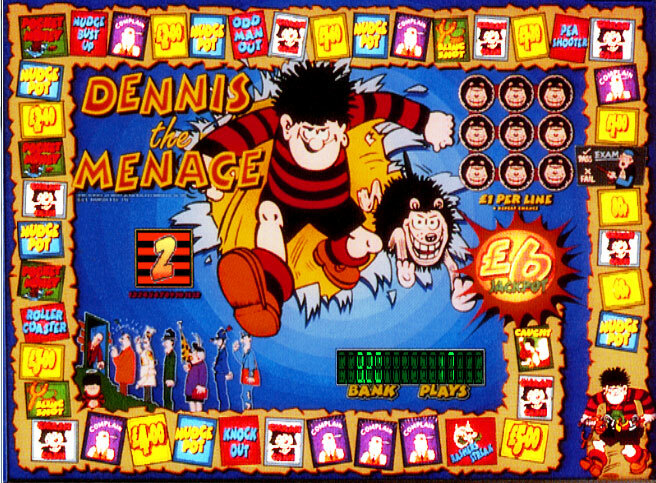 This childhood scamp has entertained generations of children with his mischievous escapades, it's hard to believe that the first episode of Dennis in the Beano magazine was actually 64 years ago! The Peter Pan of trouble stars in this very early 90's fruity. Bell-Fruit can trace their roots back to the early 1900's and as a fruit machine manufacturer they are right up there with the best. Prolific releasers of games in the early 1990's, many fans still rate the games that were released then as some of the best ever made. They are now part of the Novomatic group and still release titles for the UK market. “This time next year, we'll be millionaires” is the infamous line from dodgy Peckham market trader Del Boy. Only Fools and Horses is as English as the queen, a cherished icon of British humour at its best! Running from 1981 – 2003, the Trotters have been entertaining us for over two decades and this title produced by Bell-Fruit brings a nostalgic smile onto our face. 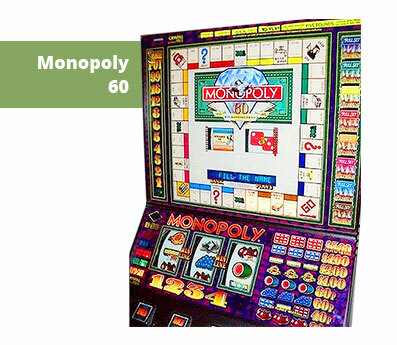 Since starting in 1965, Maygay Machines has become one of Europe's premier creators and manufacturers of coin-operated amusement and gaming machines. Maygay have released lots of exciting titles and on average they release 80 new games per year. 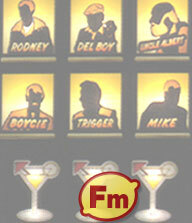 Maygay were famous for their soap opera based titles such as Coronation Street and Eastenders. Being a huge fan of the original video game, this was a machine that I used to spend a lot of time on. 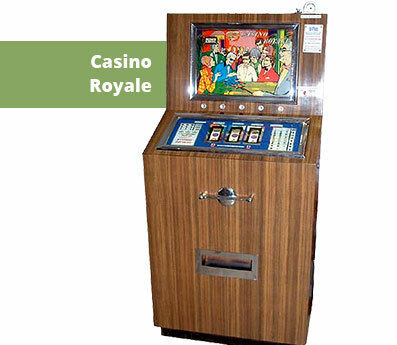 This classic was back in the days when a jackpot would give you tokens but luckily for me I was at the drinking age then so very often the tokens would get exchanged for beer. A great typical Maygay title although I did often wonder why Donkey Kong was wearing a kipper tie! You have read through the page and you are keen to replay some of the classics that sadly are no longer available, so that's it right? Well no! You will be pleased to know you can still play these retro marvels, right at home without the hassle of scouting through the old arcades. One way is to delve into the second hand market and purchase an old fruity, sites like http://www.preloved.co.uk/ and of course www.ebay.co.uk often have many machines for sale. If you have transport and are willing to travel to pick up a machine you will find many bargains out there as many people buy old machines and then decide they take up too much space and they end up gathering dust. Another more practical option is to use one of the many emulators that are available, these emulators use the chipsets that the actual machines use. This means the game plays exactly the same as the originals, there is something great about being able to gamble when you would never risk it in real life to see what happens. 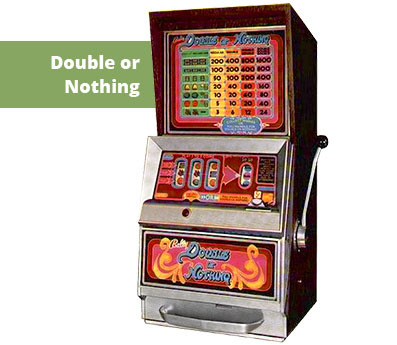 Another huge bonus is that you don't lose any money and any gameplay tips you discover will work exactly the same on the real machine. A good site for both emulators and the games (roms) is http://www.fruit-emu.com/. 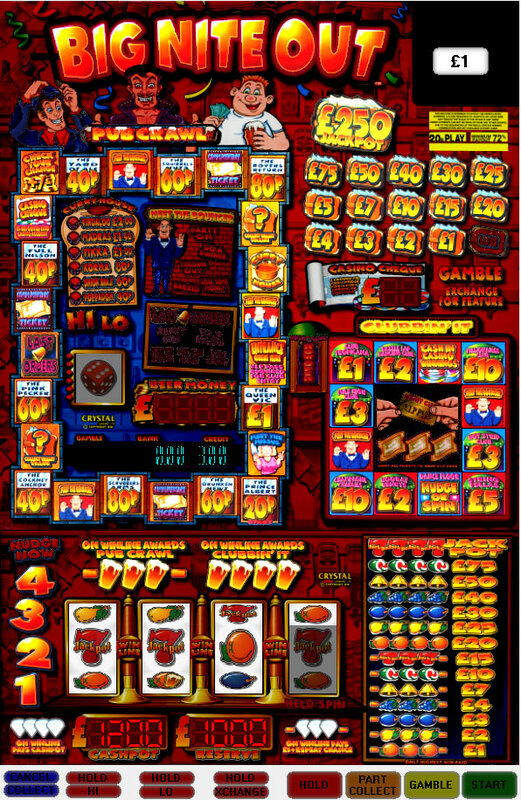 You will need to sign up but once you have done that I recommend you download MFME which stands for Multi Fruit Machine Emulator and this great program allows you to play machines from a variety of different manufacturers. 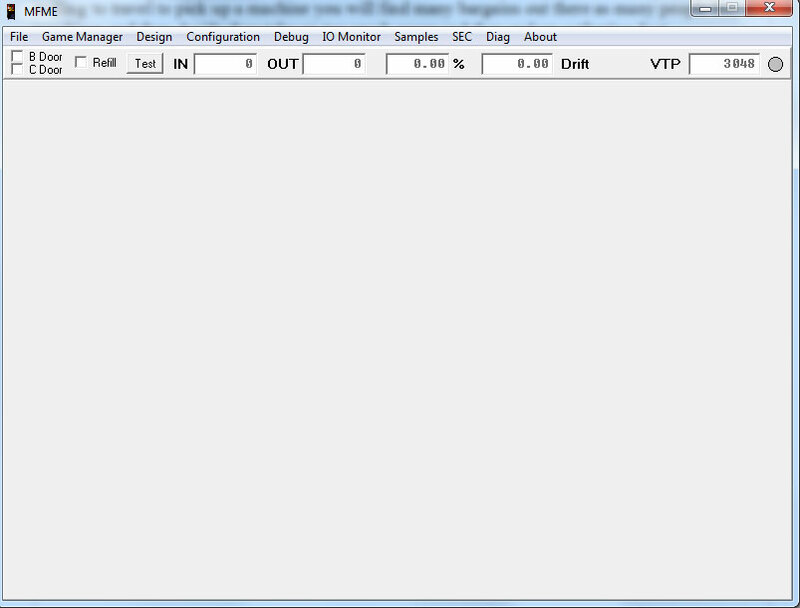 Another great program is JPeMu which you may have gathered from the name is a dedicated JPM emulator. I have put some screenshots below of the emulators in action. If for any reason you have problems with that site then Google “fruit machine emulators” and you will find there are quite a few sites to help you. It is worth the effort to play the classics again! 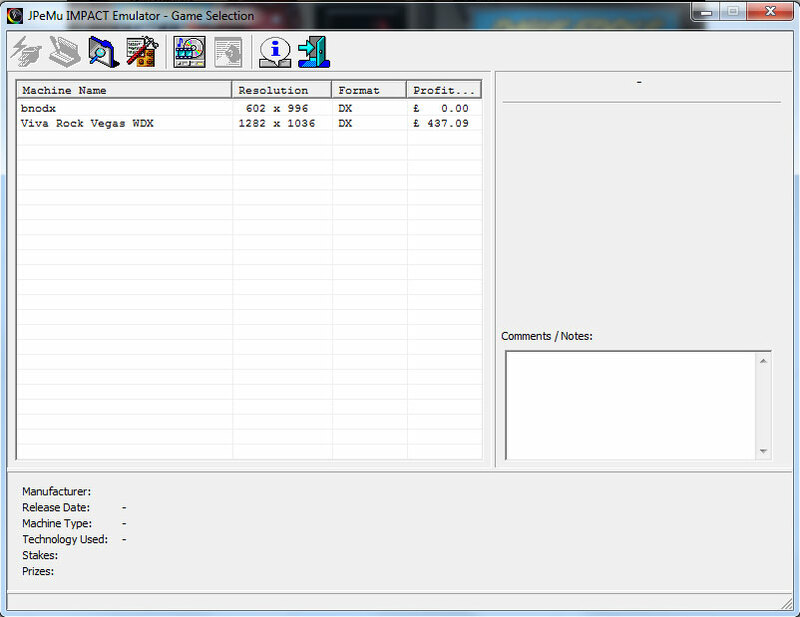 Once you download the emulators, you need to download some games and unzip them into a directory. I find it easier to create a new folder, something like c:\roms and point all the emulators to the same directory. Once you load up the emulator it should find the games.